There was a time when the UK was a byword for good behaviour and impeccable manners. We queued endlessly without complaint. We instinctively held doors open for others. We never failed to say please and thank you and apologised without hesitation if we deemed it necessary. And we almost always did. But that was another age. Furthermore, it increasingly feels like it was another country. Take these examples of modern Britain and the innate lack of manners which seems to typify contemporary behaviour. *A woman in London yells at a group of Brazilians for speaking their own language in our capital city, telling them “Speak English when walking these streets”. *A heavily-pregnant mother-of-five with a heart condition has to sit on the floor of an A&E department in Birmingham for five hours after all 50 patients and visitors refuse to give up their seats. *A newspaper reporter with more than 30 years’ experience is subjected to vile abuse online from people who have never met her and know nothing about her simply because of a story she has written. These are extreme examples of course. But the signs of a lack of courtesy towards – and lack of regard for – each other are all too easy to spot in modern Britain. You can see it in the attitude of the shop assistant who fails to pause their mobile phone conversation when you approach their till; or in the disregard shown to you by the tradesperson who never returns your call asking for help; or in the scores of people who now routinely insist on bellowing into mobile devices on train carriages, in shops and at the dining table with no appreciation for anyone within earshot. And, of course, all these low-level irritations are magnified a thousand-fold when we take to social media to tell the world about them. So here’s the Be Bold challenge for the next seven days. 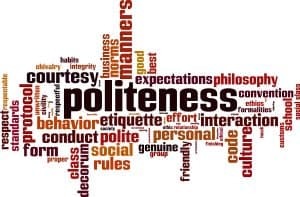 Let’s do all we can to put a smile back on the face of those we interact with by being pleasant, courteous, non-judgemental and good mannered. If others irritate us, let’s just smile and move on. Let’s say please and thank you and give the benefit of the doubt where and when we can. And let’s resist the temptation to use social media to say the sorts of things to people which we would never dream of saying to their faces. Let’s be kind to each other. Just for one week.